Dakota Shine is a ready-to-use product that restores the color and luster to faded and oxidized surfaces, such as paint, decals and plastics. Dakota Shine is a ready-to-use product that restores the color and luster to faded and oxidized surfaces, such as paint, decals and plastics. It requires no mixing and is environmentally friendly. The water-based and biodegradable cleaner removes wax buildup, grease, oxidation and grime from a variety of surfaces. 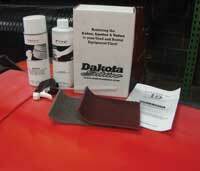 It is a cost-effective substitute to repainting oxidized surfaces, replacing faded decals or wet-sanding and waxing. Redexim North America, Fenton, Mo.